Morning service begins at 10.30 am - There are always facilities for children - All areas accessible - A warm welcome awaits. We are especially delighted if you are thinking of visiting us and we will do our best to ensure that someone gives you a warm welcome. If you are coming by car there is plenty of parking. 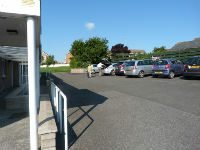 If the car park seems full it is possible to drive through the car park itself and you will find more parking on the disused road there. Failing that Higher Buckeridge Road is a particularly wide road with unrestricted parking. For details on how to get here please see our map. 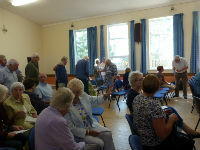 We don’t own a church building and so we meet each Sunday in the Richard Newton Hall which is home to the New Road Area Community Centre. There is usually someone at the door to greet you and offer you a welcome and a copy of our current newsletter. Our Morning service begins at 10.30. We meet in the main hall where you will find rows of chairs. Please feel free to sit where you like. We do not have a paid minister but our church is led by a team of elders. They together with other people in the church and also with visiting preachers lead our services. Consequently no two Sundays are alike and we enjoy a variety of service styles. We are a Bible based church and currently have links with the South West Baptist Association. You can read about our Faith, Belief, Purpose & Vision if you click this link. We project our hymns onto a screen on the stage. However, if for any reason, you would prefer to use a hymn book please just ask. Bibles can also be provided. Our services usually last about an hour (a little longer when we celebrate Communion) and afterwards we serve tea, coffee and biscuits. This would be a lovely opportunity for us to chat together if you so wish. We offer crèche facilities and a Sunday School. We also run Messy Church on a monthly basis. On our website you will also find information on our Prayer Meetings, Home Groups, Time Out and Fellowship Activities. We genuinely look forward very much to your visit.